On March 13th, 1969—forty-seven years ago today—the Apollo 9 astronauts splashed into the Atlantic Ocean some 300 miles north of Puerto Rico.They emerged from their capsule with the conviction that mankind was truly capable of accomplishing the impossible: to land on the moon. Commander James A. McDivitt, along with Pilots David Scott and Russell Schweickart, had just completed the most dangerous mission yet to be flown in space—a ten-day test of the third and final piece of Apollo program, the lunar module. Because of the use of two unique vehicles during this mission, the Command Service Module (CSM) and the Lunar Module (LM), it was necessary to develop different radio call signs for each vehicle. The crew assigned the names “Spider” for the ungainly Lunar Module and “Gumdrop” for the sleek Command Module that would ultimately bring them home. There were three pieces of hardware critical to the Apollo space programs: the Command/Service Module, the Lunar Module, and the awesome Saturn V rocket. This was only the second crew to pilot the Saturn V, a thirty-six-story, 6.5 million pound stage-3 rocket. 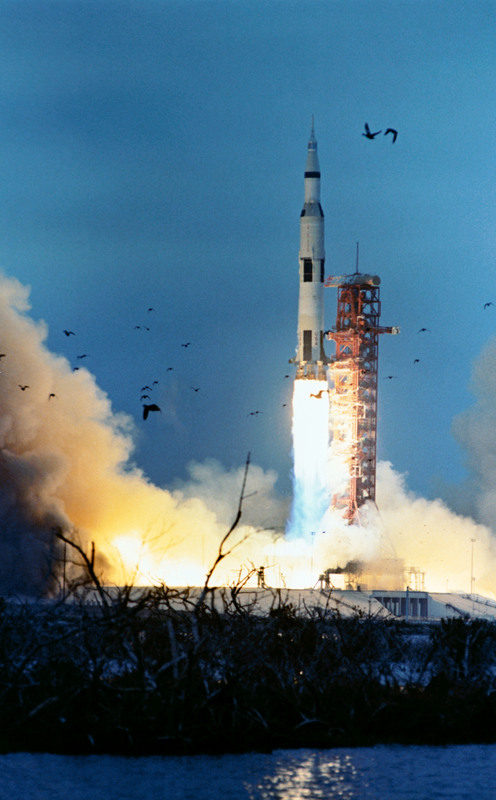 The Saturn V to this day is still the tallest, heaviest, and most powerful rocket ever brought to operational status and has been the only rocket powerful enough to propel humans entirely out of Earth’s gravitational pull. After an 11-minute ride through 3-g’s, the crew separated from the Saturn V in the second piece of hardware, the Command/Service module, or Gumdrop. The gumdrop would serve as the primary pilot ship for the Apollo missions to the moon and back. 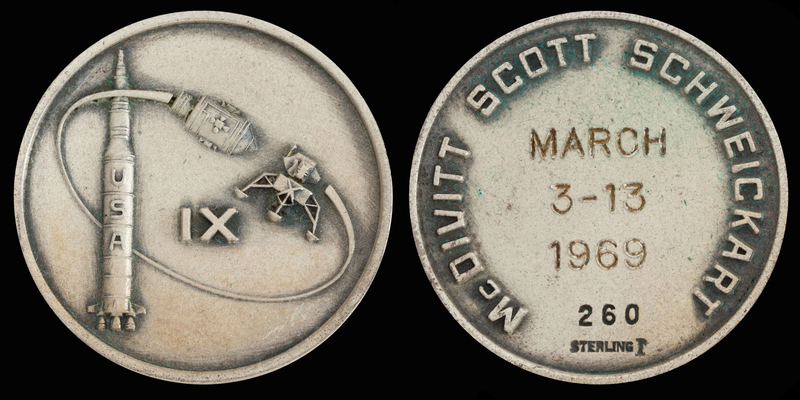 The third, and final piece of hardware was Spider which was stored in the Saturn V’s third stage adapter. In order to extract the Lunar Module, the Apollo 9 crew would have to attempt a docking procedure—the first ever in which crew members would actually transfer between both vehicles. This was would be a startling challenge of precision and nerve. Once Spider was extracted, they would continue to practice the docking procedures over and over again in relatively safe low-Earth orbit. Every possible variation or kink in the system had to be worked out and corrected. View of the Apollo 9 Lunar Module “Spider” in a lunar landing configuration photographed by Command Module pilot David Scott inside the Command/Service Module “Gumdrop” on the fifth day of the Apollo 9 earth-orbital mission. Inside the “Spider” were astronauts James A. McDivitt and Russell L. Schweickart. “Spider” and “Gumdrop” spent four days docked together in Earth-orbit, testing the main engines of both the Command and Lunar Modules. Seventy-two hours into the mission, Command Module Pilot David Scott emerged from Gumdrop’s hatch for a “stand-up” extravehicular activity (EVA, or spacewalk). Lunar Module Pilot Russell Schweickart was able to test out the next generation of spacesuit, the first with a built-in life-support system, and successfully completed the first EVA without a umbilical connection to their spaceship. One day five, after a rigorous testing and modification phase, the Spider was undocked from Gumdrop and taken on a six-hour flight nearly 160km away in space. For the first time in history, astronauts were piloting a spacecraft that was not designed to return to earth. This meant if they failed to re-dock with the command module, they would be stranded in space. Fortunately, the solo flight was a resounding success. The remainder of the mission was dedicated to further tests of the Apollo service propulsion system, which would have to work flawlessly in order to bring future astronauts home from the Lunar surface. After ten days, orbiting the Earth a whopping hundred and fifty-one times, the “Gumdrop” splashed down safely in the Atlantic Ocean on March 13th. It would be the last mission to splashdown in the Atlantic. The Apollo 9 astronauts had pushed the frontiers of human endeavors further then ever before. At last, all three major pieces of hardware had been tested, and retested, and confidence in the Apollo missions as a whole was growing, paving the way for the first landing of a man on the moon two missions later.